#2-1267, a pair of 1920s double arm hand-painted in a white-pale blue color. #2-403, pair of hand painted two-light tole sconces. Takes 60 watt max candelabra base bulb. Matching chandelier available 1-2518. #2-405 pair of 2-arm brass sconces with teardrop crystal. 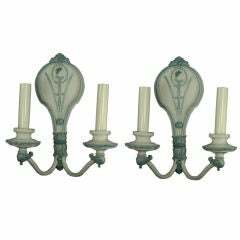 Pair of Italian nickel-plated double arm wall sconces. Murano glass conical shades. FREE SHIPPING: White Glove to Continental US. 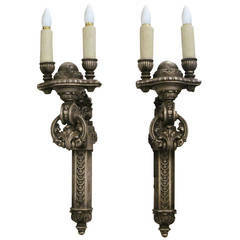 French 1920s hand holding double branch candelabra wall sconces. Pair of carved wood double-arm sconces. This item can be viewed at our 5 East 16th St, Union Square location in Manhattan. Pair of silver Caldwell style double arm sconces. 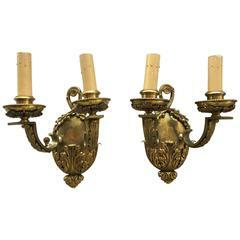 Pair of English ornate double arm brass sconces.